Sage is a tough perennial herb that should be grown in full sun. It prefers a dry situation so be careful not to over water. Sage can be grown in containers or directly in the ground. Prune after flowering to prevent the Sage plant from getting too woody and leggy. Sage is known to attract bees, butterflies and birds to the garden. 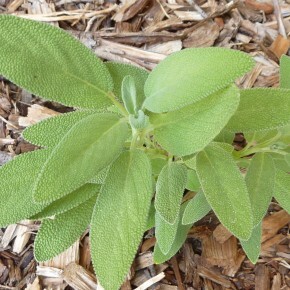 Sage is great used in poultry stuffing, butter sauce for ravioli, risotto or with pork roast or chops. It is also used to flavour sausages and cheese.